Experts say the best way to manage a looming U.S. water crisis is to thoroughly research how and where water is being used. For more on freshwater issues, also read: "Experts foresee shortages as freshwater supply dwindles" and "Aging water infrastructure ‘nearing the end of its useful life’"
The lack of funding has prompted the U.S. Geological Survey, a scientific agency administered by the Department of the Interior, to shut down more than 100 water gages used to collect data on stream flows. In Montana, a state expected to have statewide water shortages within the next decade, the lack of funding killed plans for a water database. Patten said that he has been pushing for funds to create the searchable water database. The comprehensive database would allow users to view current water conditions in the state, including stream flows, groundwater levels, rainfall figures and drought conditions. Montana’s water issues led the state to sue its neighbor, Wyoming, in 2007 over disputed use of two rivers. So far, Patten said he has been unable to fund his database. “We thought we had funding, but the governor nixed it this year,” Patten said. The accountability office report revealed that a lack of funding has killed other water-research projects, as well. In Maryland, a 2005 executive order created a committee to advise policymakers on programs related to water management. Shortly after being formed, the committee called for the development of a reliable water-monitoring network and funding for two hydrologic studies. Researchers had to discontinue the studies “due to limited funding and resources,” the accountability office report stated. Similarly, the accountability office report stated that researchers for the Montana Snow Survey Office had to reduce their snow-monitoring network, a key system that helps evaluate how much water melting snow provides. Because of budget restrictions, the Snow Survey Office discontinued data collection at 38 locations. Funding information shows that support for the snow data collection has varied in recent years. In 2011, the Snow Survey Office received $10.9 million for the program. Last year, it received $8.55 million. Matt Corson, manager of environmental compliance and stewardship for the utility company American Water, said information on water is important to the success of private utility companies, too. “You need to be able to make decisions on accurate data,” said Corson. Besides existing federal data, utility companies also collect information on water deliver and consumption. The Government Accountability Office released a report on freshwater availability last month. 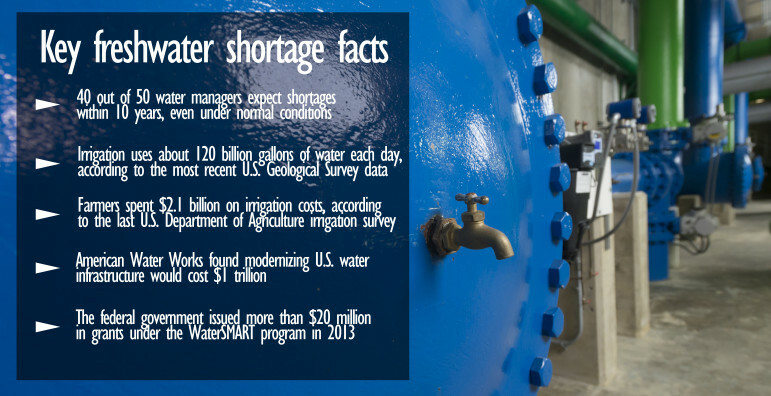 The report included a survey of state water managers, finding that the vast majority of water managers think a freshwater shortage in their state is likely within the next 10 years. Even so, countless gallons of water are wasted every day to an aging and inefficient water infrastructure. Look to the above graphic for other key pieces of information related to freshwater availability. A survey of state water managers revealed that states typically do not receive federal funding to create water management plans. About two out of every three state water mangers reported that their states have not received money from the government to back a water supply plan. About four out of every five managers reported that their states have not received money from the government to create a drought preparedness plan. 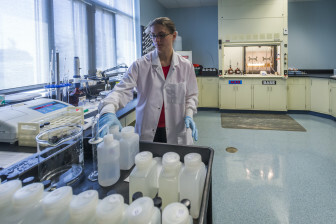 A water quality control technician checks samples in the lab at the Illinois American Water plant west of Champaign, Ill.
“These agencies are getting flat lined,” he added. The USGS is one research body that has been hit particularly hard by a lack of funding and by budget cuts. In total, the USGS keeps track of more than 8,000 continuous stream gages that measure the flow and water level of rivers and streams throughout the country. On top of that, the research agency also monitors groundwater levels at more than 3,000 wells. Several USGS officials reported that the agency periodically has to discontinue gages because of budget restrictions, the accountability office report found. About 2 percent of all USGS gages have recently been cut off. When data collection at a gage has stopped, lost data cannot be recovered. Even if the gage is reintroduced at a later time, coverage gaps limit the usefulness of the data. Federal budget records show that Congress enacted a budget of $1.1 billion for the USGS in 2012. Last year, Congress approved a budget of about $1.06 billion. Read also: "Montana's freshwater future uncertain"
“Our projections are weak, at best, beyond a month or so,” Bales said. National water availability and use has not been assessed in more than three decades, according to the report. While water is one of the earth’s most abundant resources, data show that fresh water for human use makes up less than 1 percent of all the earth’s water.